HomeEnvironmentCold Armageddon is Caused by Global Warming? Cold Armageddon is Caused by Global Warming? HISTORIC RECORD BREAKING COLD! At least two hundred million Americans are living the experience and are doubting the global warming hysteria. The sitting president, though offering no science to back himself up, makes it plain its all hogwash. “On the local news they told us not to go outside because we could damage our lungs from breathing the cold air. I’ve lived in Wisconsin my whole life and this is the coldest I can remember. I wish there was something I could do for the birds and wild animals, How can they survive these conditions?” Grand Forks, North Dakota, observed an AccuWeather RealFeel Temperature of minus 75 degrees F on Tuesday morning as winds whipped around at over 30 mph. ‘Your Ignorance Could Kill You:’ Preparing for Minus 60 Wind Chills reads the headlines. “You’re talking about frostbite and hypothermia issues very quickly, like in a matter of minutes, maybe seconds,” said Brian Hurley, a meteorologist with the Weather Prediction Center. 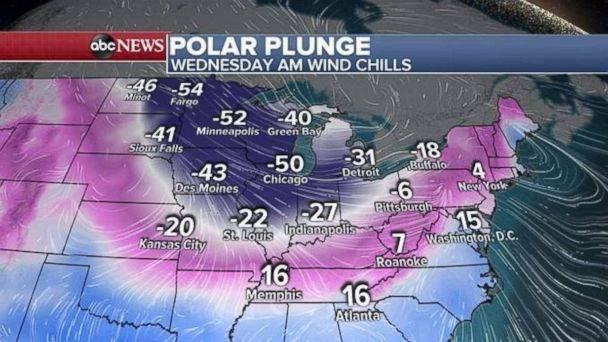 With at least nine deaths so far this week, authorities are urging people to bundle up, stay inside and check on the elderly and vulnerable. Officials are warning of almost instant frostbite (within seconds). Some parts of Minnesota and the Dakotas are facing temperatures 50 degrees below average for this time of year. We’re talking about life-threatening cold – in a supposedly warming world. Temperatures will make it dangerous for people to be outside for any length of time. In Chicago, doctors at Northwestern Memorial Hospital “have already seen individuals who have lost fingers because of the current temperatures,” Dr. George Chiampas told ABC News. A 55-year-old man was “cold and frozen” when he was found dead in a garage on Tuesday, the first of at least 12 deaths that will be caused by the cold. “Dangerous to impossible travel conditions,” caused by the cold that is caused by global warming? The exact opposite of man-made global warming is upon us in the northern hemisphere but don’t tell the computer models and the scientists who swear by them that. No matter how cold it gets the world is going to end from global warming acording to Bill Gates and the rest of the global warming crowd. 2. “Milder winters, drier summers: Potsdam Institute for Climate Impact Research, Press Release, 10 Jan 2010. 3. “More heat waves, no snow in the winter“ … Max Planck Institute for Meteorology, Hamburg, 2 Sept 2008. Still trust the media and global warming scientists and their wonderfully accurate climate predictions? Using words such as excruciating, “life-threatening,” “dangerous,” “brutal,” and “unprecedented,” the media can only speak about how warm it is and how right their climate computer models are. Few people understand that the climate change scare is based solely on the forecasts of computer models that have nothing to do with reality. Bad, biased dishonest code has led to obviously failed computer models. The climate alarmists just can’t catch a break. NASA is reporting that the sun is entering one of the deepest Solar Minima of the Space Age; and Earth’s atmosphere is responding in kind. You think we should feel sad for them or let them further cool the planet with even more intense geoengineering or some of their other crazy ideas, which they have no shortage of? The “coldest air mass in years” will hit the region with extreme cold lasting through Friday, the weather service said. Record low temperatures going back over 25 years are in progress. Temperatures will run at least 40 degrees below normal in many areas. It is so cold that the U.S. Postal Service to take the rare step of suspending mail delivery to a wide swath of the region. 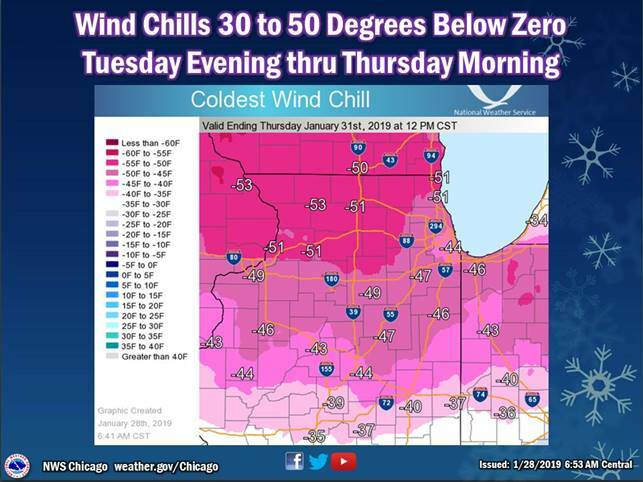 Chicago will be colder than Antarctica this week and if you want to read a really garbage reason why look at this video which of course blames the cold on global warming. Some Canadian temps comparable to Siberia. Temperature below normal by almost 20 degrees C.
“I cannot stress how dangerously cold it will be,” said Mike Doll, a senior meteorologist at AccuWeather. “An entire generation has gone by without experiencing this type of cold in the Chicago area.” The snow and record coupled with a flash freeze is paralyzing major cities like Atlanta on Tuesday because we are all living on a rapidly cooling planet. Of course this is not just happening in North America. In Sweden wintry storms ravaged parts of the north. One area recorded winds of 49.7m per second (111mph) as Storm Jan ravaged Stekenjokk near the Norwegian border. Conditions were particularly treacherous in Bavaria, where the local broadcaster said snowfalls were paralyzing public life. In Turkey snow thickness reached 2 meters bringing life to a standstill. On the night of January 8, the temperature in the capital will drop even further, to minus 13-15°C, and in the Moscow region to -18°C. The average daily air temperature will be 7 degrees below normal. We have been fooled big time by climate criminals. What else can be said about climate scientists, the mass media and a host of politicians who have been screaming at us about man-made global warming when we are faced with a rapidly cooling climate. It has all been lies, big ones, the biggest but Nature herself is having the last word as the sun cools, its output diminishing, cosmic rays increasing causing increased cloud cover and incredible amounts of snow. Just find one scientists who will dispute the low sunspots that indicate we are now plowing headfirst into a grand solar minimum. The media and mainstream establishment is simply losing its collective mind over climate change. President Trump just taunts them with sarcasm. There is a global army of radicalized, frothing-at-the-mouth, unthinking lunatics involved with the global warming scam. Its not the greatest story ever told but certainly it is the sickest and they are going to pay heavily as Nature and the Sun continue to betray them. Both outside and in people’s homes this week it will be harder than any time in modern history to keep warm. The most intelligent thing they can say is that “Donald Trump has again appeared to fundamentally misunderstand climate changeby suggesting extreme cold weather in the US is evidence global warming does not exist.” But record cold caused by the six horsemen of climate change does. There are six horsemen of climate change and all of them are cooling. 2) Diminishing magnetic protection yielding increasing cosmic rays, increasing cloud coverage, which blocks even more sunlight and warmth from the sun as it simultaneously increases precipitation. 3) Air Pollution proved to dim the sun. 4) Increased Volcanic Activity, caused by increasing cosmic rays are blocking more solar radiation. 6) Geoengineering is used, according to CIA director, to cool the imaginary global warming. If one thinks that the last mini-ice age gives us a reference think again. Back then, between 1645 and 1715, when millions died of the cold and starvation, they did not have three of the six cooling horsemen. They did not have air pollution, air traffic and geoengineering to drive temperatures down. For the past three decades, human-caused global warming alarmists have tried to frighten the public with stories of doom and gloom. They tell us the end of the world as we know it is nigh because of carbon dioxide emitted into the air by burning fossil fuels but the Six Horsemen of cold climate change are having the last laugh. For those who do not want to take the dangerous cold seriously laugh with the following video. The record cold forces all of us to rethink the global warming end of the world scenario. Headlines around the world are reporting exceptionally frigid conditions and unusually high levels of snowfall in recent weeks and to blame that on global warming is a bit ridiculous. It really is too bad that CO2 is not the warming gas it is said to be.